The Telegraph attacks the BBC, the Times tries to get some kind of AV news, The Indy leads with Marr and the Guardian leads with the Arab spring. 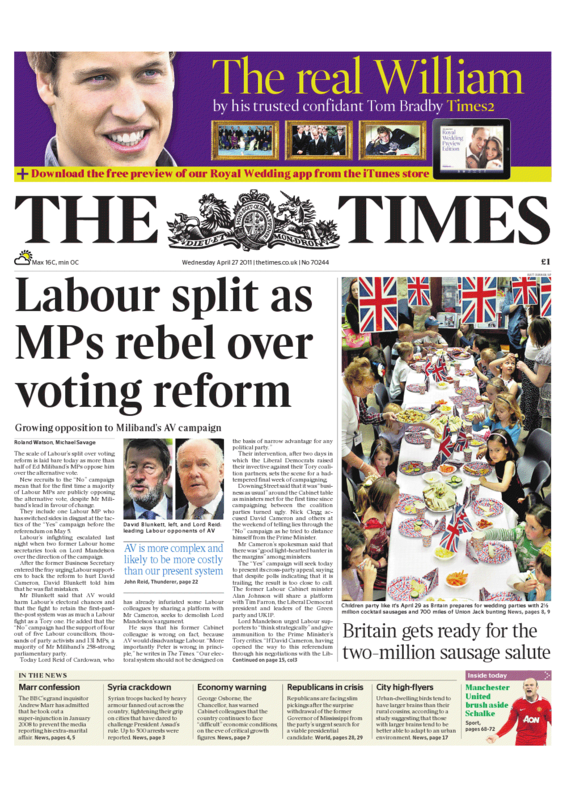 The Times claims that over half of Labour MPs are now opposed to AV. I would be very suprised if this turns out to be the case on polling day. I think a majority of the Parliamentary Labour Party will vote against, if only to give Miliband a victory. 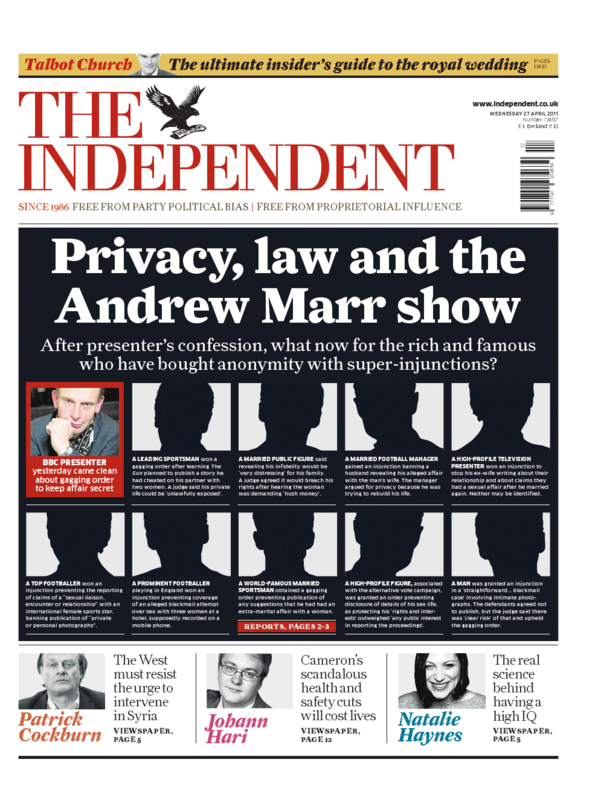 Andrew Marr was a former editor and political editor of The Independent so it must have been a tough decision to splash with it, particularly when they have done relatively little on injunctions before. In an interesting take they look at all the other figures who have current gagging orders out. 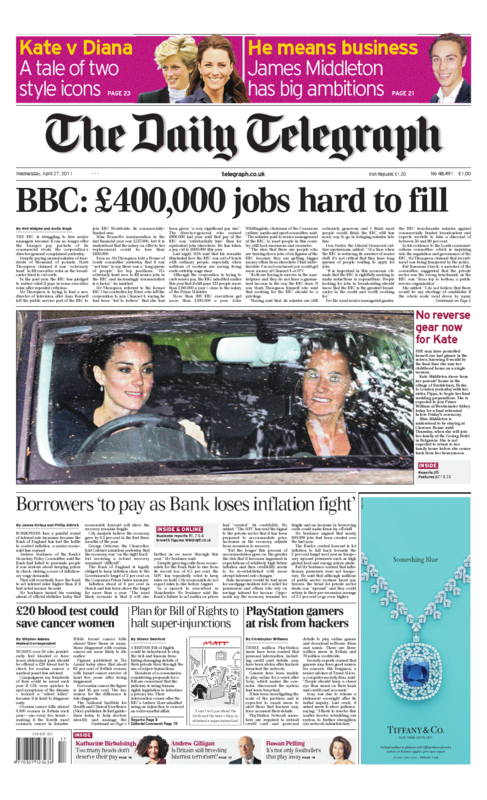 BBC director general Mark Thompson has said that the organisation is unable to get the best staff as rivals can pay higher wages as they are in the private sector. It is not a clever thing to say in public in a time of austerity particularly when it is a slow news day. Politicians in France and Italy are suggesting that the EU should close the borders from the Middle East in the wake of mass immigration because of the Arab Spring. Sarkozy and Berlusconi, never fans of immigration anyway, are also demanding deportation pacts with the countries of North Africa. This entry was posted in Front pages catalogue. Bookmark the permalink.